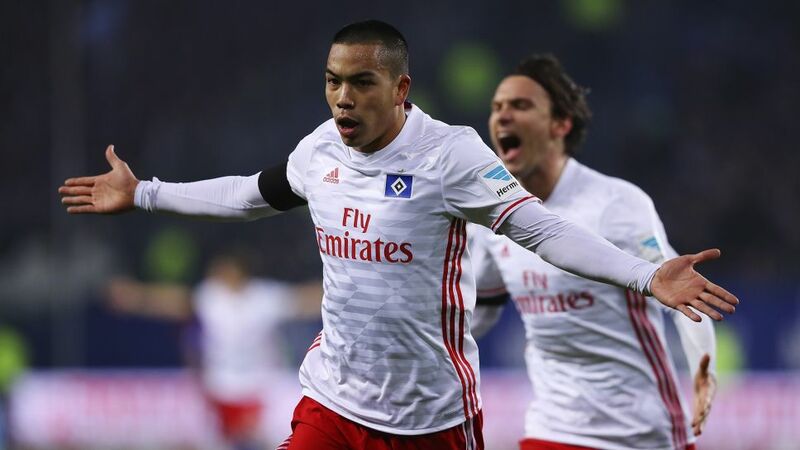 Have you got Bobby Wood in your Official Fantasy Bundesliga team? If not, sign him up now! It has been a long road from Hawaii to Hamburg. Bobby Wood readily admits that, growing up in Honolulu, he had close to zero football culture. He recounts the occasion when – as a nine-year-old – he found himself watching a 2002 FIFA World Cup game with his friends from a local team. "I had no idea what the World Cup was," he told The Players' Tribune. "Seriously. No clue. I just wasn't a soccer-crazy kid. I wanted to be an American football player — the helmet, shoulder pads, tackling guys to the ground. All that stuff." Unfortunately for young Bobby – but perhaps luckily for his future employers, not to mention the USMNT – he would end up playing football, for the most prosaic of reasons. His mother shared a carpool with another woman who had signed her son up to play football, which meant that Bobby had to play too. He admits that his first training session did not go quite as planned. "It was pretty clear I had no idea what I was doing. I was a newbie, I looked ridiculous, and I didn't play much better on the field either. My coach told me, 'All right, Bobby, you just go in goal and we'll take it from there.'" Wood's stint between the sticks would not last long. Soon enough, the coach picked up on his impressive speed and tried him out as a striker instead. It turned out that he had much greater flair for putting the ball in the back of the net than for keeping it out. He continued to improve, although he was still far from football-obsessed. "We didn't get a lot of matches from Europe on TV," he explained. "I didn't even know you could play soccer as an actual job. As far as I knew, Zidane might as well have been a tennis player. David Beckham? Who? I know it sounds crazy – but listen, I was a beach kid who kind of got thrown into all this." Things began to change when Wood's mother decided to move the family to California, where he would have the chance to attend better schools, and play on better teams. While he originally saw the switch as just a new adventure, Wood quickly realised that football was becoming more than just a hobby. "Once I got to California and started playing for a club in Irvine, something just... changed. Soccer became competitive. And all of a sudden, that part of it – that part of me – just took over. I didn't just want to play for fun anymore. I wanted to be the best." Short of being the best, Wood began watching the best. He was able to tune into Premier League games on the Fox Soccer Channel, and Arsenal's Thierry Henry soon become one of his idols ("the way he scored goals was so pure"). But while he had been one of the stars of his team in Hawaii, the competition was much stiffer in the Golden State. "I soon found out that California was sort of the breeding ground for top soccer talent in the U.S. I wasn't nearly the best player on the team. I never got picked for the Olympic Development Program. I never got picked for a national team either." Instead, on the advice of one of his coaches, 14-year-old Wood made the rather radical decision to move from the United States to Germany, where he had been given the opportunity to train with 1860 Munich. At this point, he had never even been to Europe. "Go to Germany, you will be among the best in Europe," he was told. "You will get there, but you need to train in Europe." Wood arrived in Germany in the summer of 2007, and quickly realised that becoming a professional player would be anything but plain sailing. Not only did he have to adapt to the weather – having only lived in Hawaii and Southern California, European winters were a whole new experience – he also had to contend with the language barrier, and the highly competitive nature of top-level youth systems. "The academies in Europe are pretty cut-throat," he says. "We were only 14, but boys got sent home because the coaches thought they just weren't good enough. This wasn't like in the U.S., where everyone plays to have fun. I was expected to be a professional – training and playing seven days a week in hopes of the slight chance that I would make the first team at some point." Wood describes the early days with 1860 Munich as "lonely", especially as a young foreigner in unfamiliar surroundings. Not speaking German, it was tough for him to fit in – but he refused to let the other boys' teasing get him down, and resisted the temptation to return home to California. Instead, he made a crucial decision. "One day at a time," he recalls. "That was it. I was thinking too much about what was going on and I wasn't focusing on my game. I was there to play soccer. So I was just going to play one day at a time. I controlled the only thing I could: what I did on the pitch." It paid off. Wood's coaches began to see his true potential, and after three years in the academy, he was promoted to the 1860 Munich reserve team. Yet just when things finally seemed to be coming together, disaster struck. Wood had been struggling with a knee injury, and – just a month after joining the reserves – he was forced to undergo meniscus surgery. After months of rehabilitation and training, he returned to the pitch – only to immediately sustain another tear. His future at 1860 was suddenly in doubt. With time on his contract running out, Wood faced the prospect of having to return home without having reached the first team squad. Given his knee problems, the club were hesitant about keeping him on their books. But then he got that little slice of luck that often makes the difference when it comes to professional football. "One of my coaches from the youth academy was named second-team coach, and he pulled me aside. 'Just stay one more year and get your knee healthy,' he told me. 'I believe in you'." And he really did. So I stayed and I worked on my knee for a year and got back onto the second team. And by the end of the season, he was named manager of the first team and he brought me along with him. I signed my first professional contract with a club." Wood made his first Bundesliga 2 appearance for 1860 in January 2011, but it was not until December 2012 that he put pen to paper on that first professional contract. After two more years in Munich – alternating between the first team and the reserves – he spent six months on loan at second-tier Erzgebirge Aue, before signing for Union Berlin in the summer of 2015. After a breakout season – in which he scored 17 goals in 31 appearances – he signed for Hamburg in May 2016, and prepared for his first taste of the German top flight. "To play in the Bundesliga... you can't really describe it," he says. "Walking onto the pitch in front of thousands of screaming fans every weekend – it's unlike anything I ever could have imagined. I think back to that day when I was nineand watching the World Cup with my friends... everyone in their kit, faces painted, just pouring their hearts out. I didn't understand it at the time. I didn't understand what this sport means to people. Or, really, what it could mean to me. I get it now." 'Like' the official Bundesliga page on Facebook! Wood made quite the entrance on his Bundesliga debut, scoring what would later be voted the Matchday 1 Goal of the Week against Ingolstadt ("I don't think I'd ever jumped so high!"). The American's performances have been a silver lining throughout a difficult campaign for HSV. With nine goals in 23 games in all competitions, he is comfortably their top scorer (Nicolai Müller and Michael Gregoritsch have netted four each). He is also part of the USMNT generation that is taking the Bundesliga by storm – along with Christian Pulisic, John Brooks, Fabian Johnson and Timothy Chandler. Having made his international debut under Jürgen Klinsmann in 2013, Wood has notched up seven goals in 25 appearances for the U.S., including against Costa Rica at the Copa America Centenario 2016, and in recent World Cup qualifiers against St. Vincent and the Grenadines and Mexico. Now 24, Wood's mission is clear: to keep Hamburg in the Bundesliga for what would be a record 55th consecutive top-flight season in 2017/2018. "I feel the tradition that's all around this club and what it means to the city," Wood said. "I want to do a lot for this club. And as an American, I want to do a lot in this league. And right now, that means fighting with Hamburg to survive in the Bundesliga. One day at a time." Click here for all the latest Hamburg news!